Company: Acanthurus sohal (Sohal surgeonfish) should not be kept with similar species, lionfishes and groupers. Aquarium Setup: Acanthurus sohal (Sohal surgeonfish) is adapted to a life at a coral reef or a rocky bottom, usually living along steep slopes. Keep this in mind when you decorate the aquarium. Provide them with strong water movement and vigourus aeration. No ammonia, no nitrate and no more than 25 ppm of nitrate. An adult Sohal surgeonfish need at least 50 gallons of water. pH should be buffered and stay between 8.0 and 8.4. Temperatures should ideally be in the 70’s or the low 80’s F.
Food: Acanthurus sohal (Sohal surgeonfish) eat different sorts of algae, particially Sargassum and fine filamentous green algae. Feed frequently, preferably many small portions spread out over the day. An algae rock or automatic feeder can make this more manageable. 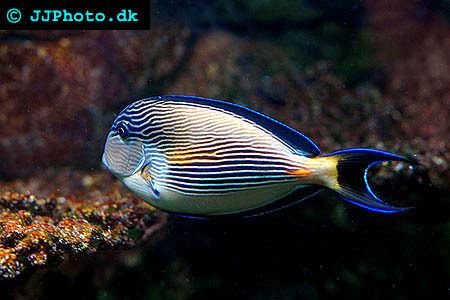 Breeding: We have no information regarding the breeding of Acanthurus sohal (Sohal surgeonfish) in aquariums.